As a landlord or property investor you must consider tax liabilities at the various phases of owning and renting a property, from purchasing, letting and on sale. HMRC considers any costs that are essential to performing your duties as a landlord or maintaining the property to be “allowable expenses”. By offsetting these expenses against your rental income it will reduce your potential tax liability. However, please always be aware of what is deemed to be the distinction between a capital expense (generally building improvements) and a revenue expense. Revenue expenses relate to the day-to-day running and maintenance of the property and can be offset in the year they fall against your rental income. Capital expenditure is not a tax deductible expense against rental income, however, you may be able to offset these costs against any capital gains on the disposal of the property. Your income from investment property may be substantially affected by the reduction in tax relief available for finance charges. From 6 April 2020 landlords affected will no longer be able to deduct any of their finance costs from their property income. This could potentially push you into a higher tax band and trigger losses of other benefits and allowances. It will also increase your tax bill as basic rate tax relief on finance charges will be given as a credit against your tax liability. New measures will gradually restrict your tax relief to the basic rate of income tax. Let’s say that your only income for 2015-16 was £120,000 from rents received before deductions for mortgage interest of £80,000. Your income tax liability would have been £5,880. Recalculated with the tax relief as it will be in 2020 your tax bill would increase to £25,043. Plus – your income would be calculated as being much higher from the same rents! When it comes to selling your rental property you will probably be liable for capital gains tax on any gain made. Basic rate taxpayers pay capital gains tax at 18%, which increases to 28% for those paying tax at the higher rate. It is advisable to obtain specialist advice to potentially assist with minimising any potential liability. There are a number of ways to reduce the capital gains tax (CGT) liability, one of which is to utilise the annual tax-free allowance that each individual is entitled to claim. The allowance is £11,300 in the 2017/18 tax year (£11,700 in 2018/19). Therefore no CGT will be chargeable on the first £11,300 of the gain (assuming this annual exemption has not already been used). You do not pay CGT on your main residence, this is known as private residence relief. Also if you have, at some point, lived in the property which you have then rented out and sold there are further potential deductions that can be made against the gain to reduce the tax bill. There are a number of other possible deductions from CGT and this is certainly an area we recommend you obtain professional advice, please see the contact details below in order to do this. There are clear advantages as companies are not affected by the reduction of tax relief for finance costs. If you can afford to retain profits in the company the only tax payable is corporation tax. Potential downsides include increased costs to administer the company and exposure to personal tax and stamp duty. You would need to thoroughly examine the tax risks and strategies open to you. 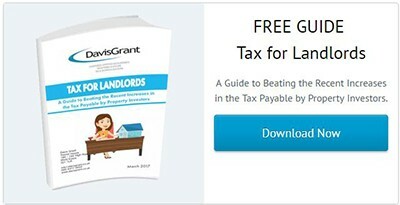 Therefore before proceeding, we strongly recommend you take personal advice from an expert such as Davis Grant Accountants who have specific experience in this area. Since April 2016 an additional Stamp Duty charge on additional residential properties is made. If you buy a second property on top of your main residence, then the charge will be payable. The only exception is if the property is replacing your main home. The 10% ‘Wear and Tear Allowance’ on letting income was abolished on the 5th of April 2016. This has been replaced with a ‘Replacement of Domestic Items’ relief applied based on your renewal of furnishings for the tenants use. Existing item provided for the tenants use. Replacements only, on a like for like basis. Initial expenditure is not included. No distinction is now drawn between furnished and unfurnished properties. Fixtures such as baths, fitted kitchen units and boilers, that are not normally removed by the owner when the property is sold are not included. This is because the replacement cost is already a deductible expense as a property repair. There are a number of ways to plan ahead when it comes to potential future tax liabilities, both for the letting income received and any gain on a sale. For further advice and to arrange a meeting to discuss potential structures and tax planning, please contact Barry Chernoff on 020 8477 0000 who will be pleased to assist.